At the mention of pandan, what comes to your mind? Heavenly, aromatic, yummy kuihs and cakes. Right? Pandan or also known as screwpine is one of South East Asian prized flavoring treasures. In Malaysia, we simply called them as pandan, pandan leaves or daun pandan (in Malay). I’m really proud of our pandan leaves. Besides using pandan mainly as flavoring agent in baking and cooking, you can also use pandan as coloring agent. I’ve been wanting to learn how to make pandan juice from scratch for the looooooongest time. Because I never make any desserts requiring pandan juice (actually more like I skipped them because I always thought making pandan juice is hard work), the learning process never takes place. Well until I decided to learn how to make chiffon cake that is. More precisely pandan chiffon cake. I know I can’t escape this time. Tsk, turns out making pandan juice is not as hard (or scary) as I imagined it to be. My pandan plant on garden bed which has grew into three adults pandan bushes and many babies (not visible from this angle). Young pandan leaves are light green in color and thin. 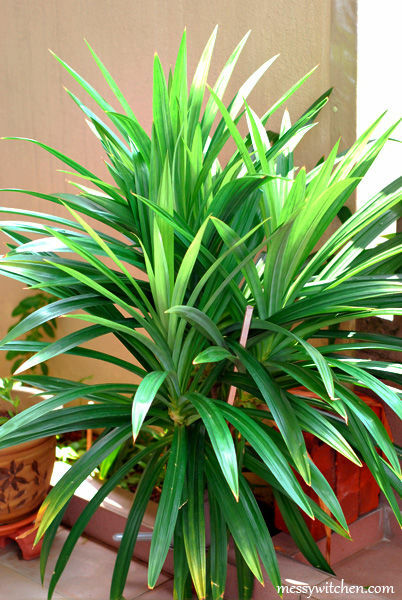 They grow and become matured pandan leaves which are green or darker green and thicker in texture. Old pandan leaves are those that are near the soil, really dark green in color and extremely fibrous. If you don’t have pandan plant at home, where can you get pandan leaves? 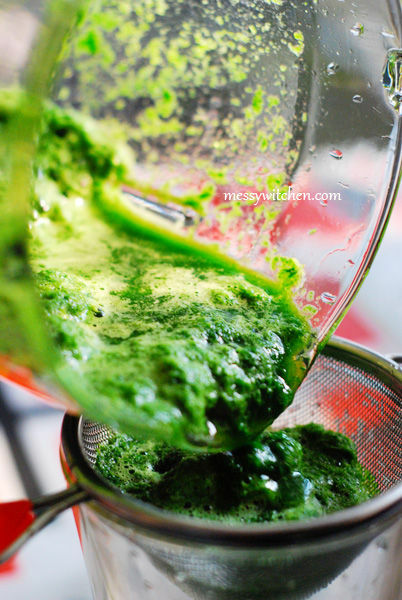 To make pandan juice and pandan extract, use matured pandan leaves. 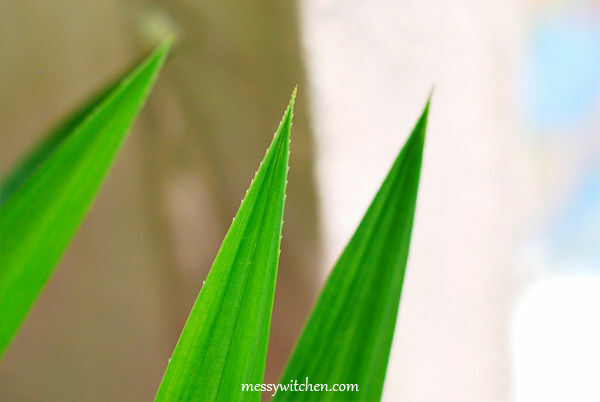 When you’re picking matured pandan leaves, look for the young light green leaves. Matured pandan leaves are those located right after the young leaves. Pick those. You’ll need 10 pieces. I read from one blog that suggested using young pandan leaves. For comparison and education purpose, I’m going to make pandan juice and pandan extract using both young and matured pandan leaves. At the end of this post, I’ll let you know which one has better aroma, color, etc. Here’s a comparison between young and matured pandan leaves. The colors are very different. Also snip off the whites at the base of the leaves (they are quite bitter). Then you can rinse the leaves to get rid of dirt. You don’t have to let the leaves dry thoroughly since you’ll be adding water later on. 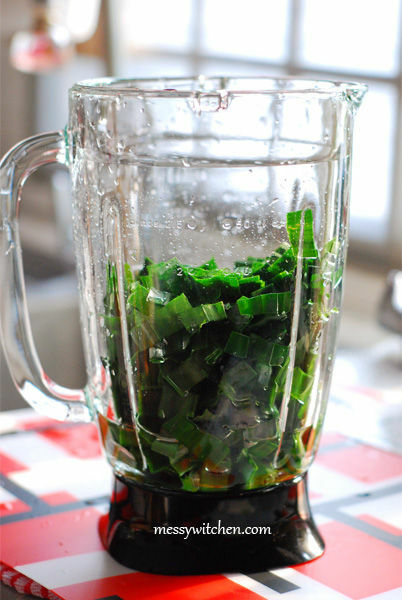 Use a pair of scissors and cut the pandan leaves around 1cm-2cm length into the blender. Because pandan leaves are fibrous, they can wear your blender’s blade. So cut as thin as you can (even less than 1cm if you prefer). But because I’m a wild child 🤘, mine is usually between 2cm-3cm. Tsk, you can also choose to use a knife to slice the leaves. But I prefer scissors as I have one less thing to wash (cutting board) and because I can just cut the leaves and fall right into the blender. Here’s another comparison between young and matured pandan leaves. You can see the differences in colors and thickness of the leaves. In this photo, I’m using 20 pieces matured pandan leaves. For 10 pieces of leaves, the level will be half of this. 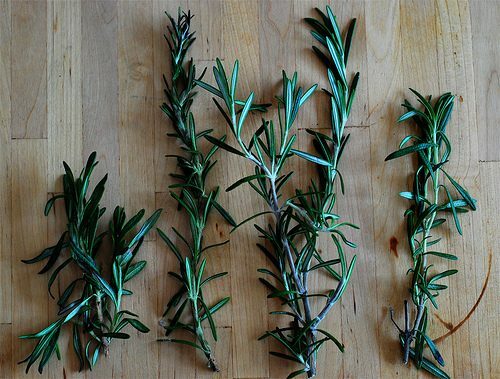 Add a cup of water (200ml/200g) and blend the leaves. For how long? Around 1 minute give and take. Note: If the recipe calls for less amount of pandan juice, I would advise you to start with about 100ml of water first. Pour the pandan pulp through a fine strainer. You can also use muslin/cotton cloth for straining. I find using this fine stainless steel strainer is good enough. 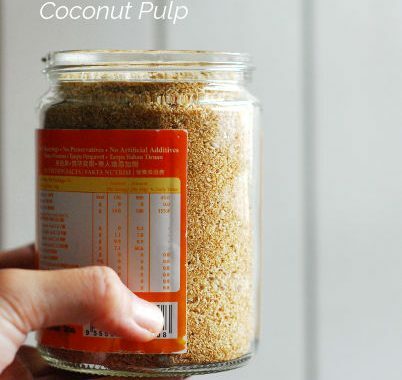 Use the back of a spoon to press on the pulp to get the juice out. 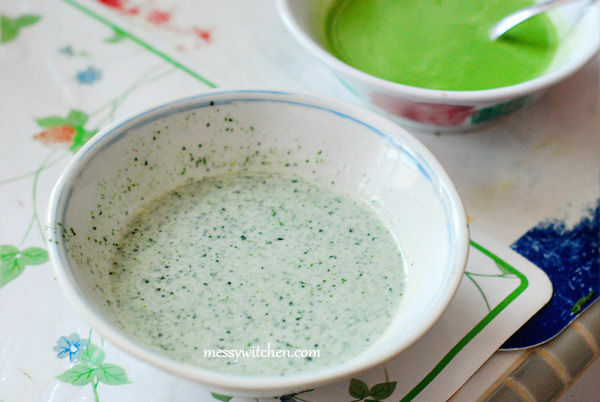 If you want, you can blend this pandan pulp again with another cup of water. You’ll get a lighter shade of pandan juice. 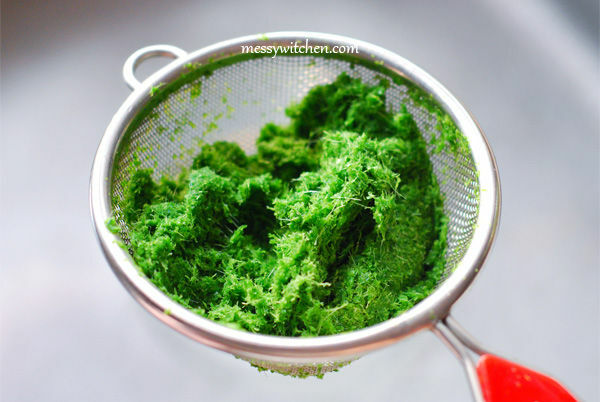 Use it for recipe requiring pandan juice or you can make pandan extract from it as well. I usually blend the pulp once only because I have no other uses. I don’t discard the pulp into rubbish bin. Instead, I use them as compost for my plant. 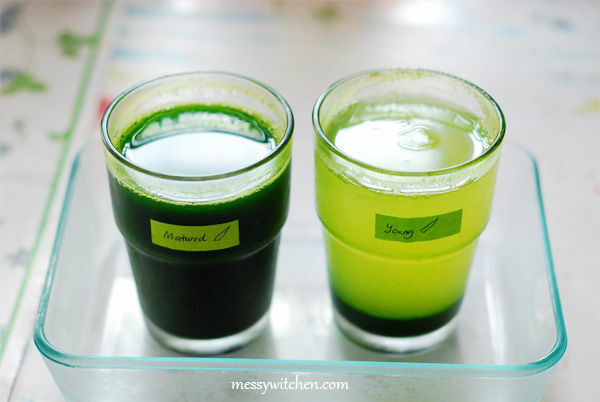 On the left is pandan juice made from matured pandan leaves (darker in color) and on the right is pandan juice made from young pandan leaves (lighter in color). 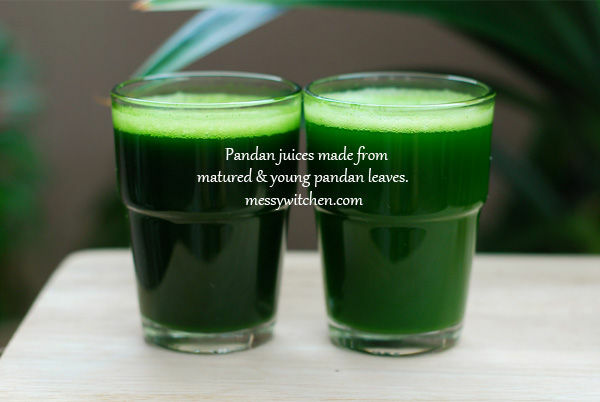 Because matured and old leaves will absorb more water compared to young leaves, I’m guessing that’s the reason why the pandan juice quantity made from matured leaves is less (by a tiny bit) compared to pandan juice using young leaves. There is also suggestion in the web to use santan (coconut milk) instead of water for blending (if the recipe is using santan). If you’re doing this, make sure you prepare enough quantity of santan since the santan liquid can be absorbed by the leaves. Use this pandan juice to make pandan flavored cakes (chiffon, layered cake), kuihs (kuih talam, onde-onde, serimuka, kuih dadar), kaya, jelly, green jelly noodles for cendol, waffle, ice-cream and many more. Extra: This is pandan juice made from 20 pieces matured pandan leaves and 250g water. So yes, pandan extract has the same meaning as concentrated pandan juice. 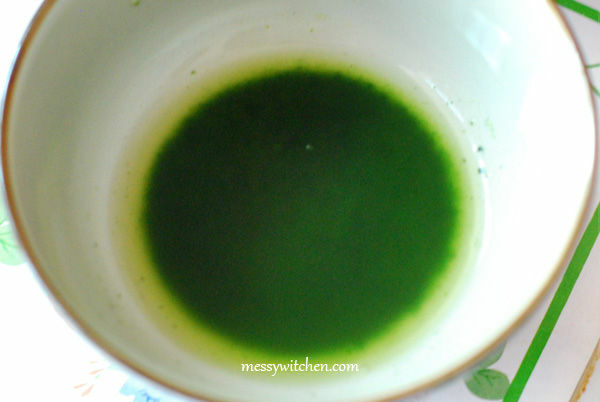 I never knew we can make pandan extract until I chanced upon Wendy’s concentrated pandan juice blog post. 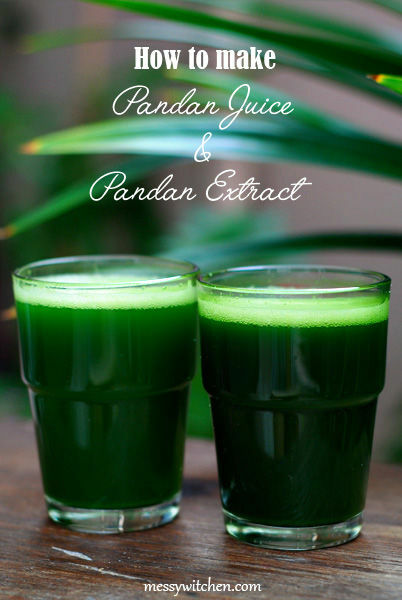 To make pandan extract, follow the exact steps in making pandan juice. Once you’ve the pandan juice in a glass, cover with a lid or cling film and leave it in the fridge for few days. Don’t place the glass at the fridge door as frequent movement will slow down the separation process (huh? read on and you’ll know why). I use the pandan juices from matured and young pandan leaves which I made earlier (jump to two photos above) to make pandan extracts. Here’s the progress 8 hours later. The pandan juice made from matured leaves has not changed but for the juice made from young leaves… you can see a clear separation. The dark green sediment at the bottom of the glass is pandan extract! This is the pandan juice of matured leaves 33 hours (1 day 9 hours) after putting it in the fridge. Still work in progress. It’s beautiful though, right? Pandan extract made from matured pandan leaves done after 55 hours (2 days 7 hours). 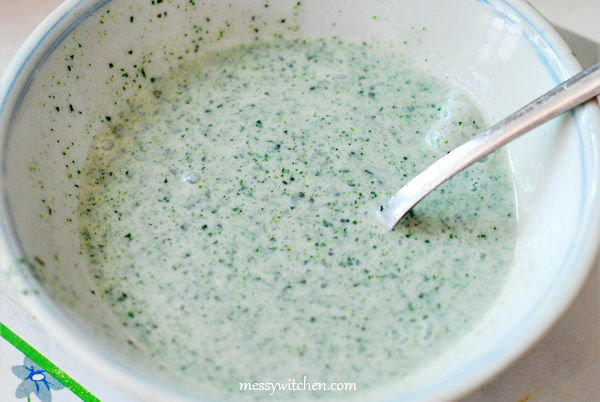 To use the homemade pandan extract, slowly pour out the upper layer into a bowl. The pandan extract looks glossy and slimy, like when you squirt green watercolor paint from the tube. Btw, don’t throw away the upper layer. Smells it. It still has that lovely pandan aroma. You can add this to red bean soup or even cendol or barley. 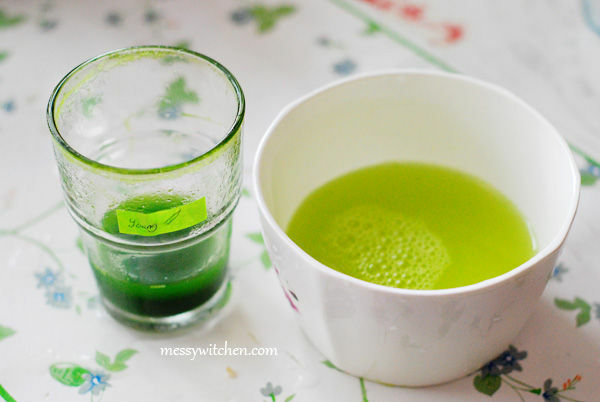 And if you’re making another round of pandan juice, why not use this light green liquid instead of water? Good idea, right? 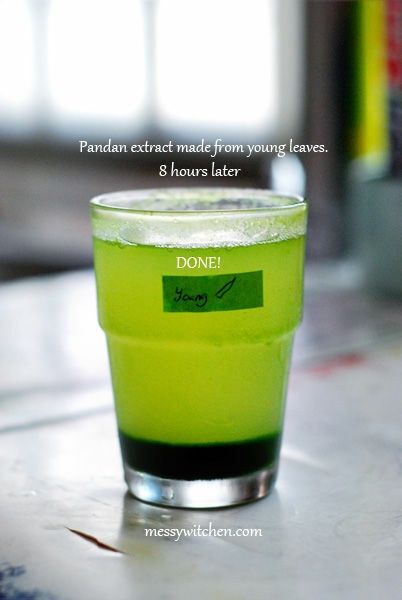 It only takes 8 hours to make pandan extract from young pandan leaves while it takes 55 hours for matured pandan leaves. Both using 10 pieces of leaves. 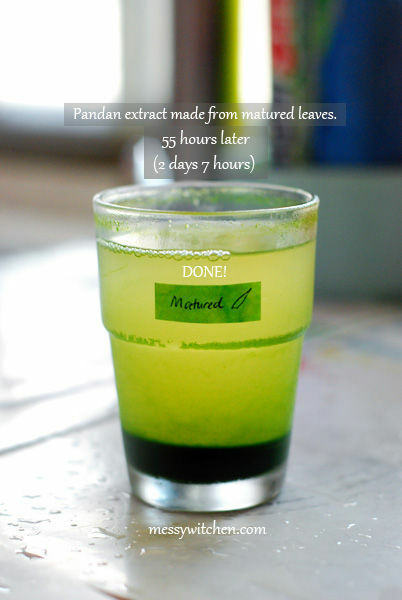 It took me 88 hours to make pandan extract out of 20 pieces of matured leaves. 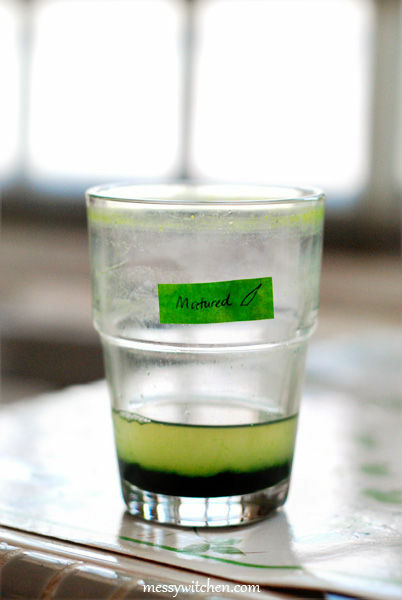 From this test, I can conclude that using matured pandan leaves for making pandan extract needs more days of waiting. I’m not sure if there are other factors involved such as how fine you blend the pulp. All I know is the sediment of matured pandan leaves take longer to sink. 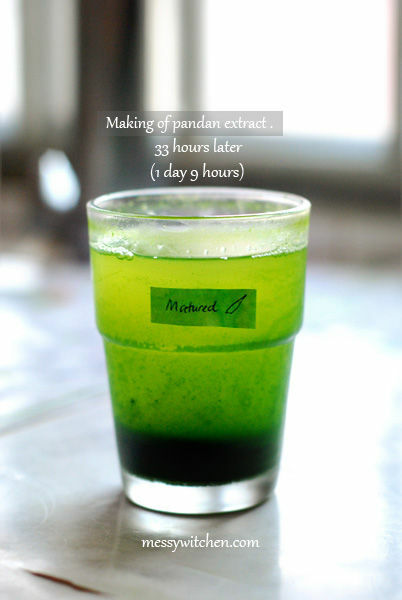 Since making pandan extract needs couple of days of waiting, make sure you make the extract few days in advance. Remember to use only matured pandan leaves. I store pandan juice and pandan extract exactly using the glass shown in the photos in this post and cover with cling film in the fridge. You can also store in plastic or glass container with lid. 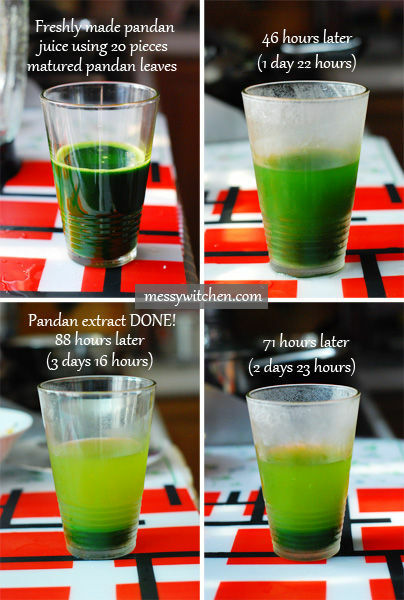 Remember: If you store pandan juice too long, it will become pandan extract after a few days… which is not really a bad thing. Win-win situation. How long can they be kept? 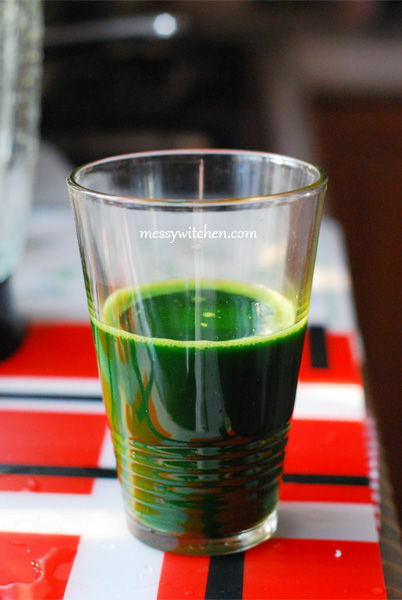 Pandan juice and pandan extract can be kept as long as they doesn’t smell rotten. I have one kept only for like 5-6 days and another one going over a week. Can I freeze pandan extract? No! Don’t ever freeze it. It looks normal (maybe just a little weird). I had poured out most of the upper layer before putting in the freezer. I poured the extract into a bowl. Not looking good with very very faint pandan aroma. I added the extract to santan (coconut milk) because I was making chiffon pandan cake. Look at all the disintegrated (separated) greens? A comparison with the evergreen freshly made pandan juice mixed with santan (background) and the ill-looking defrosted pandan extract mixed with santan. So yeah, remember don’t freeze it! Below is a comparison table between pandan juice made from matured leaves and young leaves (using 10 pieces of pandan leaves each). Tsk, you don’t have to worry about the bitterness. 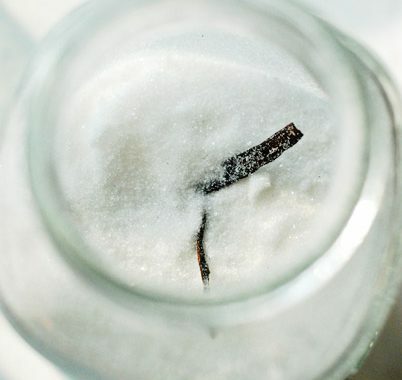 Once you add sugar, the bitterness will be gone. 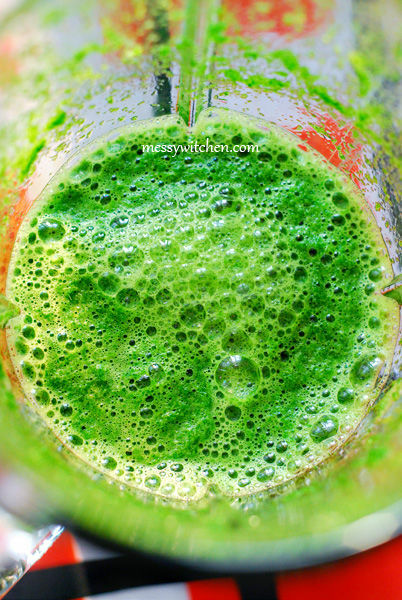 Between using freshly made pandan juice and pandan extract, I recommend using freshly squeezed pandan juice for best result. Your dessert will smell so much nicer with fresh pandan juice. I can attest to this because I made two pandan chiffon cakes using fresh pandan juice and pandan extract for comparison. If you need large quantity of pandan juice or extract or extra ‘pandan-kick’, you can use 20 pieces (or more) of matured pandan leaves. Otherwise 10 pieces of leaves are usually more than enough. 2. Decorate your home with pandan leaves in a vase. 3. Give your kitchen cupboards or drawers nice pandan fragrance. 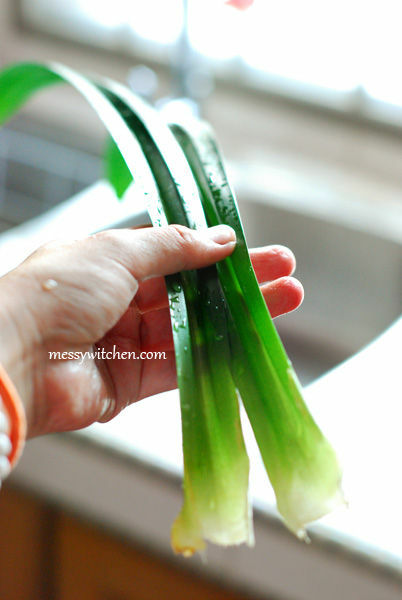 Tie 2 pandan leaves in a knot and place it in your cupboards and drawers. 4. 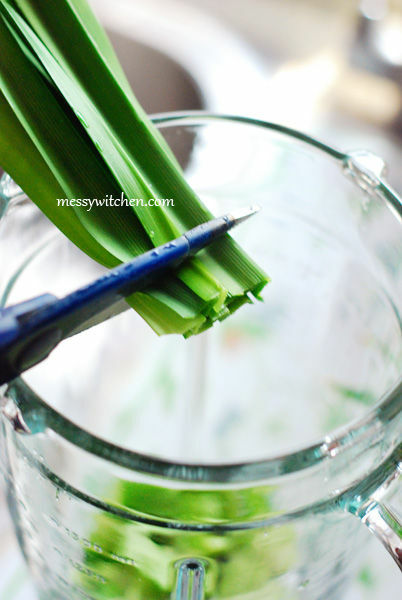 Make pandan brush for greasing pans, cake moulds, satay and BBQ meat. Hope you find this post useful. Let me know if you have anything to add. Oh interesting comparison between the young and matured panda leaves! LOL 😆 You are really a PANDA!!! Hi Dawn, I kow tow you for using mortar and pestle to ‘menumbuk’ the pandan leaves. Super difficult. Wait, if pandan juice is better, then why the need for pandan extract? Hi Valere, good question! If you’re going to use it as coloring agent (natural color for icing or cake for example), pandan extract is the better choice since it’s more concentrated. Hi Mahleeh, I asked my grandma about it as I have no experience. She said nope as dried leaves no longer has that distinct strong pandan fragrance. And the reason why we extract/juice it the first place is to ‘mine’ the fresh flesh to get the green color and also aroma. Try looking for frozen pandan leaves if you can’t find fresh ones. I just got a pandan plant! I’m going to try putting the leaves in my Hurom slow juicer and see what the juice to pulp ratio will be. Then I might try your blender technique with the pulp and water for a second extraction. Is there any advantage to making a pandan extract if it doesn’t freeze well, and takes a day or more to create? 1. for its concentrated green color; natural green without preservatives. 2. for ease of time; since you can make it a day or two ahead and keep in the fridge.